After a debut album that included only two original compositions, Bob Dylan effectively launched his singer/songwriter career from here. He still used traditional folk melodies but now he added his own unbelievably mature, prophetic and wise beyond his years lyrics. The cultural impact of this album simply cannot be overstated. 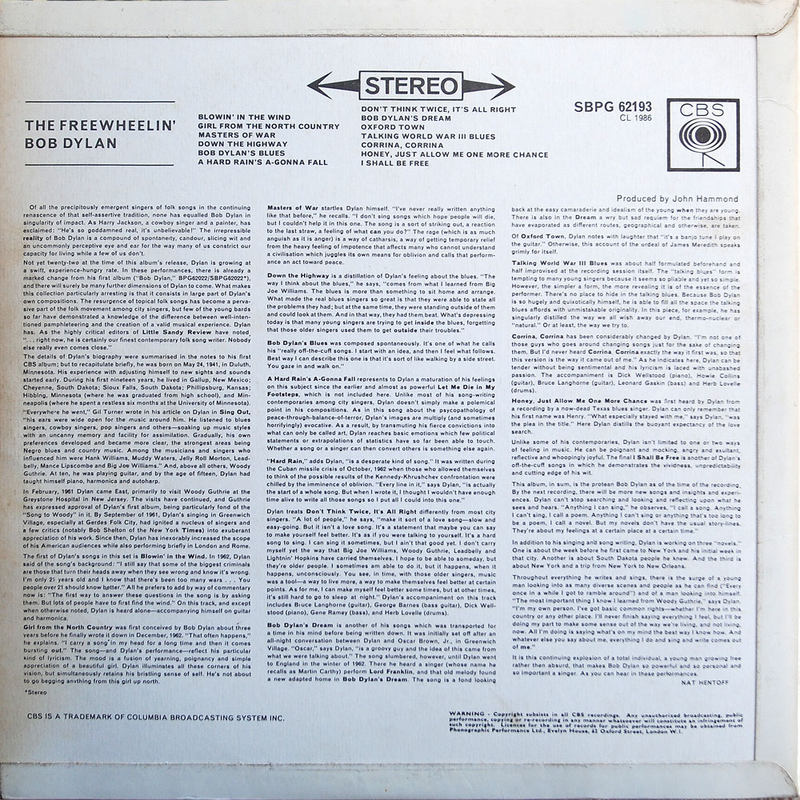 Some of the songs on here became synonymous with the early sixties, the burgeoning folk scene, particularly in New York's Greenwich Village, and with an increased need in the young and intelligent to protest. The songs embraced the Civil Rights movement, political corruption and the omnipresent early sixties paranoia about impending nuclear war. He also had love songs on here, but they were not "moon in June"/"baby I love you" odes - they were often cynical, bitter and accusatory, something continued for a fair few years. 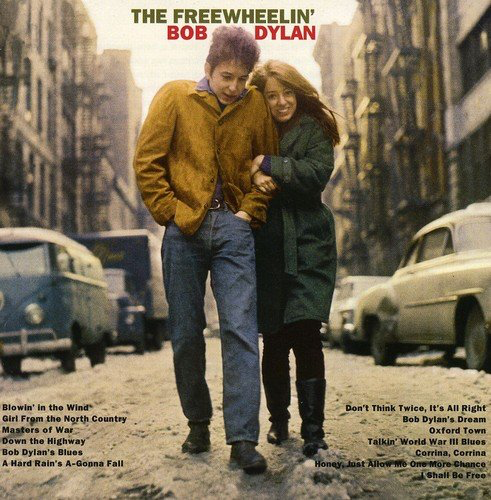 As fetching as the picture is on the front cover, I have always felt sorry for poor old Suze Rotolo, who must have been on the receiving end of Dylan's acerbic tongue on many occasions. 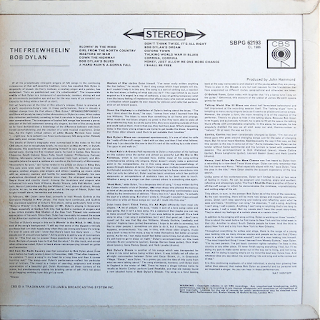 "Blowin' In The Wind" is, of course, an absolute classic, and has been recorded by many other artists, including Peter, Paul & Mary, Stevie Wonder and Neil Young. 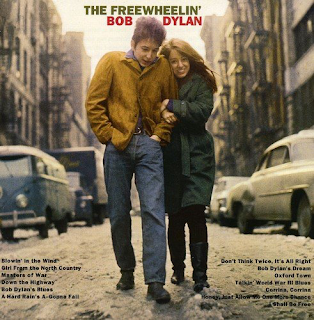 It is the daddy of all anti-war protest songs, articulating beautifully and starkly against an acoustic background Dylan's fears for the world's future. The line "how many years can some people exist before they're allowed to be free..." perfectly aligned the song with the Civil Rights movement too. Quite simply, this song, written by a twenty-one year-old, is one of the greatest songs of all time. The incredibly bleak "Masters Of War" is another whose subject is hard-hitting and obvious, although the apocalyptic "A Hard Rain's A-Gonna Fall" is a mysterious journey through all manner of imagery, biblical, poetic, mythological. It is a work of inspired genius. Other classics are the vitriolic, leaving his lover song in "Don't Think Twice, It's Alright", the far more yearningly, atmospherically beautiful "Girl From The North Country" and the excursions into the blues tradition of the folky, harmonica-driven "Bob Dylan's Blues", "Down The Highway", "Corinna Corinna" and the old blues cover of "Honey, Just Allow Me One More Chance". The pure folk tradition is there in "Bob Dylan's Dream" and "Oxford Town". "Talking World War III Blues" shows Dylan's black humour at its most obvious, but, for me, it it has always been slightly irritating and dated. As I mentioned earlier the impact of this remarkable album and its songs was immense, but, as someone who owns all Bob Dylan's albums, I rarely play it. I much prefer subsequent live, often bluesy or electric live versions performed by Dylan of the songs, or indeed, covers of them by different artists. Check out Dylan's storming full band, rocking version of "Masters Of War" on "Real Live". It completely transforms the song. The same applies to many of his versions of "Don't Think Twice", or Neil Young's blistering "Blowin' In The Wind".